Synthetic pesticides and fertilizers were a part of the “green revolution” of the 20th century. Because of their efficiency in killing pests, quickly they had become a staple product in all plant operations - from large agricultural fields to small home gardens. However, only in recent decades have we started to learn about the disadvantages and dangers of using synthetic pesticides. Unfortunately, because of their chemical structure, it turned out could be an agent behind many damaging and dangerous processes happening in natural ecosystems, as well as in human bodies. Many of the once commonly used pesticides (think DDT) are now labeled as dangerous carcinogens, while others pose a threat to global bee populations. These are the main reasons people have started to look into organic gardening and using natural fertilizers and pesticides. Since so many insects eat plants, many of them have developed complex chemical mechanisms to defend themselves. From these plants, we can extract some very efficient insecticides which are safer for humans and their pets. One of the plants that show great versatility in combating plant pests is the neem tree. This wonder plant goes by the scientific name Azadirachta indica and it is native to India. In its country of origin, neem has had a status of a sacred tree since it is an important ingredient in traditional Indian Ayurvedic medicine. Neem oil has been an especially prized ingredient in for making both traditional and modern neem remedies - from cosmetics to insect repellents. And the later is exactly what we are interested in. Insecticidal properties of neem oil make it a natural ally in our gardens. Neem oil is a nature’s gift from plants to plants, so to speak. What Is Neem Oil Made Of? l, which may make up for 50% of the seed's weight. That is why neem oil is extracted from kernels inside the seeds. The by-product of oil extraction is the so-called neem cake, basically made up of kernel remains. It can be used in gardening and agriculture as a pesticide and a fertilizer. Interestingly, the cake is also used in organic livestock farming as an alternative to antibiotics - it is added to the animal feed to treat parasitic, bacterial and fungal diseases. How Can Neem Oil Kill Insects? Neem oil has an adverse effect on over 200 species of plant-feeding insects, and there are claims that this number is as high as 600! These include mealy bugs, aphids, cabbage worms, thrips, whiteflies, mites, fungus gnats, mushroom flies, locusts, beet armyworms, the Japanese beetle and other leaf-feeding beetles. And how neem oil actually works as a pesticide? It contains a component called Azadirachtin, a natural insecticide and repellent which acts as a feeding and growth disruptor. What this means is that once consumed, azadirachtin will prevent insects from feeding, stunting their growth and preventing the larvae from reaching the next instar or adult form. In a while, the colony of harmful insects will die out. Besides messing with their metabolism, neem oil repels insects with its strong aroma, making the plant unpleasant for the bug to consume in the first place. Insecticidal properties are not all that neem oil has to offer to a gardener. 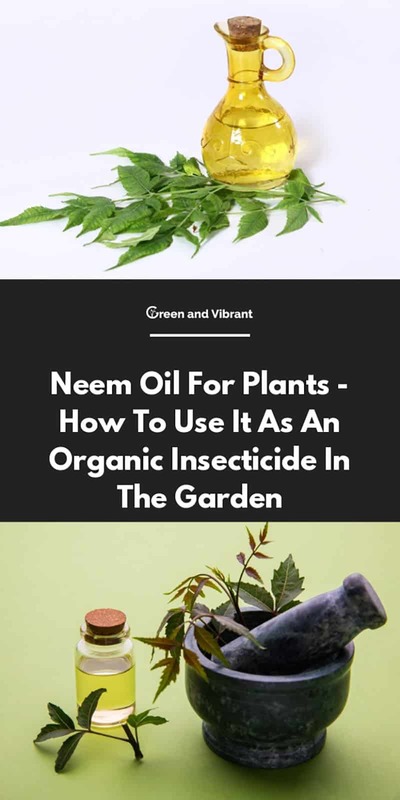 Besides insects, neem oil and neem-oil based products are also effective against nematode worms, as well as against many well-known, pesky fungal diseases such as powdery mildew, black spot and rust fungi. There are claims that neem oil can even prevent plant viral infections. How To Use Neem Oil Properly? If you want to try neem oil in your garden, you have two choices. One is to buy commercial neem oil gardening products. The store-bought, brand-name versions of neem sprays are (usually) well-tested and safe to use. Also, there is a convenience of buying a ready-to-use product instead of doing an additional job of finding and mixing the ingredients yourself. However, store-bought neem oil products usually contain less azadirachtin than the ones you can make from pure oil, which could make them less efficient in solving your pest problem. Also, they could contain additional compounds that you may not want to have in your garden. Additionally, because of some legal limitations covered in our next section, brand-name neem oil sprays might be actually unavailable to buy in your area. Making a DIY neem oil spray at home lets you choose the ingredients and concentrations you would like to try in your garden - and it means you can change the “recipe” according to your observations and the experience. For example, you can experiment with higher or lower neem oil doses and explore the effect different dosage on your common pests. However, you will need to be extra-cautious with DIY sprays. Different plants can react differently to home-made solutions and their components (e.g. the concentrations of oil or soap), and some of these reactions turn out to be quite bad. There is one important general rule when it comes to making your own insects sprays: do not blindly trust the efficiency and safety of DIY formulations from the web without adequate testing. If you just spray the affected plant or your entire garden without doing a test run first, you could end up with some damaged or dead plants. This goes for all DIY sprays, not just neem oil ones. Аlways test the formulation of your choice on a small part of the plants first and watch what happens in the next 24 hours. As I pointed out previously, homemade neem oil insecticides can be more potent than the commercial ones. By carefully selecting the good quality neem oil, you will get a high amount of the active compound azadirachtin in your solution - probably higher than in the store-bought version. And azadirachtin is what kills pests. 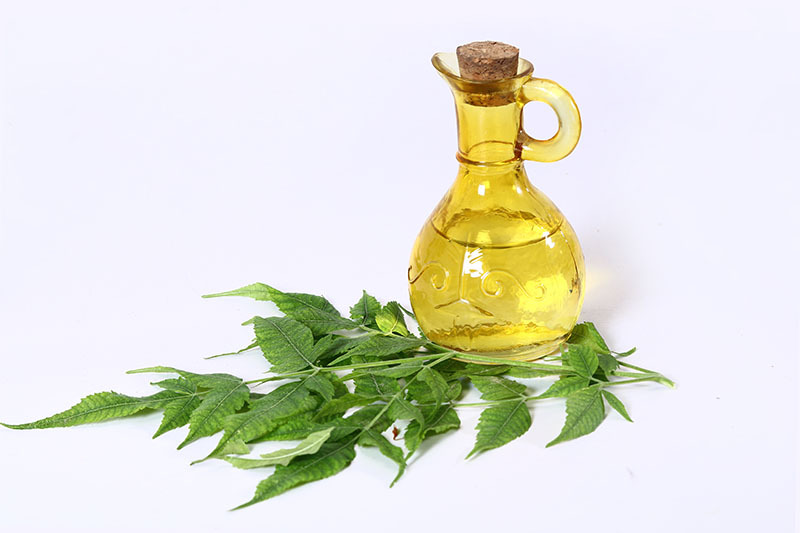 Look for 100% pure, cold-pressed neem oil - these usually go by the name “crude” or “raw” neem oil. Cold-pressed is important since Azadirachtin is destroyed by heat, which means that heat-derived oils won’t have a lot of this precious active compound within them. Also, by buying organic neem oil you will avoid any contamination with chemicals or solvents that might come into contact with plants during the regular, uncertified purification process. You won’t need many ingredients to make a neem oil spray - just the oil itself, water, and an emulsifier. Don’t let that last word scare you, because the deal is simple. Oil and water do not mix, so you will need to add a mild liquid soap (an emulsifier) to the mix. 1 teaspoon (5ml) of neem oil. ⅓ tsp (1-2ml) of mild liquid soap, insecticidal soap or another mild detergent. Other sources say that 1 tsp of soap is also fine. Mix water and soap in a closed bottle and shake well so the soap is fully dissolved. Add the neem oil, and shake again. The concentration of 0,5-1% is the most common for general and regular garden use, although you can experiment with 2% sprays if you think you need a stronger solution. How To Use The Neem Oil Spray? Always test the neem oil spray on a limited area before applying it generously. This cannot be overstated. Spray your solution on the affected plant leaves, but only on one limited part of the plant at first so you can watch for any adverse effects for a day. If the plant seems to take the spray well after 24 hours, you can proceed to spray the entire affected area. You can use the neem oil spray when you need it, or regularly - once per week is a good measure. Using the spray regularly will make it a preventive solution, which is especially useful if you know you have an upcoming pest infestation in your area. As with other oil-based sprays, make sure that leaves are completely coated so the active ingredients will have full contact with insects and fungi pests. Never use your neem oil spray in direct sunlight. Do not spray your plants in extreme temperatures, both hot or cold. Do not treat the plants that have been stressed with bad growing conditions, such as drought or overwatering; improving the plant's conditions prior to spraying is important to avoid adding damage by spraying. Keep the neem oil and the neem oil spray in a safe place to avoid ingestion by children or pets. Since neem oil is very bioactive and potent in combating both insects and other infectious agents, it would be naive to think that it is 100% safe for other creatures at all doses and situations. 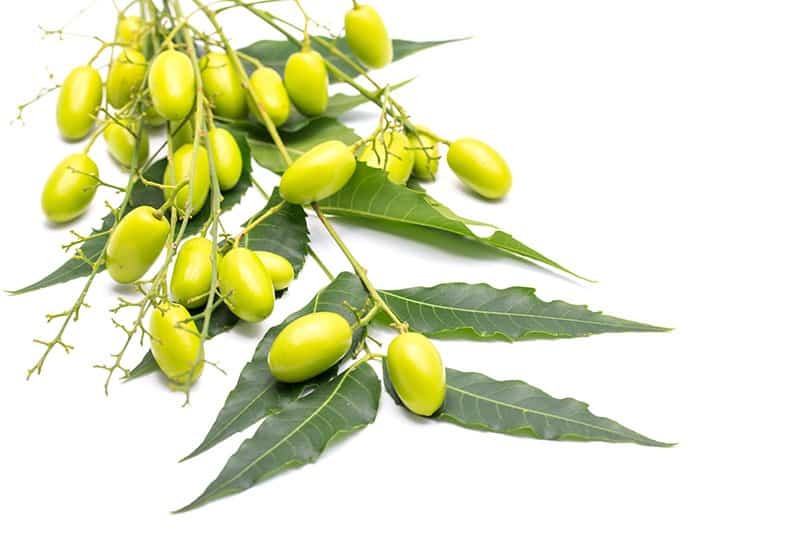 In humans, there are case reports of severe toxicity caused by ingestion of pure neem oil - 20ml oral dose caused vomiting, convulsions and toxic encephalopathy. It has been reported that it can have adverse effects on children’s livers, and also on women’s fertility. Therefore, groups that should stay away from any neem products - not just neem pesticides - are women trying to conceive, pregnant women, and children. The EPA recognizes neem oil-based products as safe, so any residue on your produce is acceptable. However, although neem oil is an organic pesticide, all fruits and vegetables that have been treated with neem sprays should be washed in clean water thoroughly before use. This goes for any edible veggies or herbs from your garden, sprayed with any solutions. Is Neem Oil Legal To Use? If you live in the UK or in the European Union, you should know that the sale of pesticides that contain azadirachtin is controlled and regulated, and therefore those pesticides - including the neem oil products - might not be readily available. Neem oil is commonly used in organic production, but if you raise certified organic products, check with your local organic agricultural society and with licensing bodies if using neem-based products is ok, just to be on the safe side. Plants are compact chemical laboratories and contain many compounds that can help us control many diseases in our gardens, especially insect infestations. And since these molecules are naturally occurring, the damage they can do to their surroundings is much smaller than with man-made pesticides. Neem tree is one such plant. Using neem oil-based solutions and products can have multiple benefits for your garden, all while keeping you safer. Neem oil sprays are one of the ways to have an organic garden while still using a safe chemical weapon against pests. To our knowledge, the toxic effects of neem oil sprays are limited to leaf-eating insects and other herbivorous organisms such as nematodes. Before resorting to synthetic pesticides which have to be used extra-cautiously since they can harm human and animal health and influence biodiversity, it might be worth looking is what nature has to offer. Have you ever used neem oil spray in your garden? Did you buy it or made it yourself? What are your experiences? Let us know in the comments!